It was the start they needed coming off five straight playoff series losses at the hands of the Boston Bruins – dating back to the 1969 quarterfinals. And while it’s just one game, the Toronto Maple Leafs grabbed home-ice advantage in a series where they came in as underdogs to the physical, high-powered Bruins. That said, the Maple Leafs did steal a win in Game 1, holding the Bruins number one line to just one goal and finding a way to out hustle the home team for most of the game. While that’s a small takeaway from Toronto’s 4-1 victory in their opening game, here’s a few more thoughts on the team’s big win. Less than three minutes in, Maple Leafs’ forward Trevor Moore laid a big hit in the offensive end on Bruins’ defenceman Brandon Carlo. The size difference between the two is noticeable. But it’s nothing like when Moore threw the body on six-foot-nine defenceman Zdeno Chara. While the line only saw less than 10 minutes of ice-time through Game 1, their physicality made them a valuable 10 minutes and showed the Bruins that the smaller Maple Leafs were, indeed, a force to be reckoned with. But it wasn’t just Moore. Connor Brown showed that he, too, can throw around his body with a big hit on Marcus Johansson. But the fourth line for the Maple Leafs also outplayed their opponents with the puck as well as on the physical side of it. While the fourth line for the Bruins finished the night with a Corsi For Percentage (CF%) of 33.3 at five-on-five, while the Maple Leafs’ trio of Moore, Brown and Frederik Gauthier finished the game with a 44.4 CF% at five-on-five. Their speed kept the Bruins defence on their toes and was a major change than what the Maple Leafs have iced in past series. So long as Toronto can rely on their fourth line to remain unpredictable – both physically and offensively – the Maple Leafs could use them as step up on their rival Bruins. You’ve probably read it numerous times since the horn went to mark the end of Game 1. Chara looked slower than usual. Boston has some issues breaking out of their own end. And, aside from the pretty passing play that led to the Patrice Bergeron goal, the Bruins looked stifled on the offensive side of the puck. It didn’t help that Frederik Andersen seemed to be back on track in playing his game. 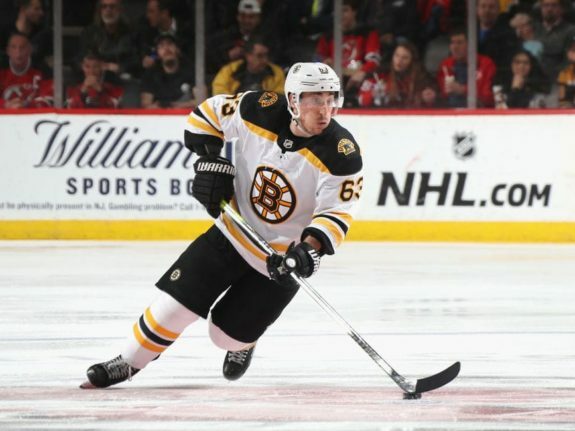 But according to Bruins’ forward Brad Marchand it was more of an issue that the Bruins took the Maple Leafs too lightly. Bulletin board material or not, the Bruins definitely didn’t look the same in Game 1 as they have most of the year. But, as the Maple Leafs have seen in the past, that can change on a dime. If the Maple Leafs want to find a way past the Bruins, they will have to remember just how explosive Boston’s offence can be moving forward. He was their star during the regular season and is already making his presence felt in the postseason both on the scoresheet and in the heads of their opponents. No matter how you unfold the Maple Leafs’ win in Game 1, Mitch Marner was a major piece for the blue and white. Forget for a second that he scored two goals, including a shorthanded penalty shot and the game-winning goal, but he was constantly on the puck throughout his time on the ice. He finished with five shots, four takeaways and even had a hit in just over 19 minutes of play. On top of that, he’s shown that he can play in all situations with 1:50 of penalty killing time – including the shorthanded goal – and 1:14 of power play time. He finished the game with a 58.6 CF% at five-on-five and 50.0 CF% on the penalty kill. 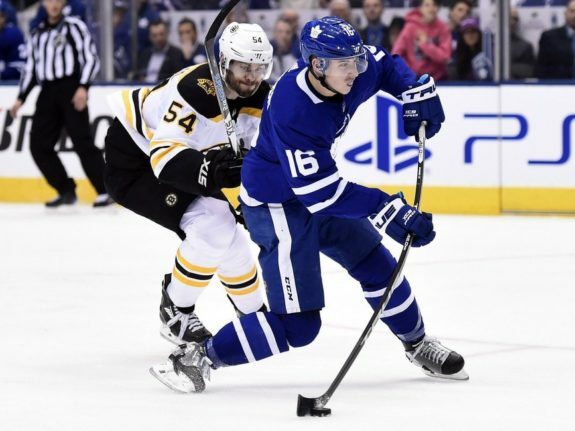 He’s a spark plug for the Maple Leafs and they seem to go they way Marner goes, which is why the Leafs will rely heavily on the small forward if they have any chance to get past the Bruins. The lack of power play opportunities might be a storyline to focus on. While it likely won’t last through the remainder of the series, the story in Game 1 was the lack of special teams opportunities. The Maple Leafs had just two penalties called against them, while the Bruins had one. And while the Maple Leafs couldn’t capitalize on their one power play, the Bruins lone goal came on their first power play opportunity and from their top line nonetheless. Tempers will certainly flare as the series progresses, but if the Maple Leafs can keep their penalty killers off the ice the way they did in Game 1, it’ll limit the chances for the Bruins’ trio that has had so much success against them over the years. Either way, it’ll be a different game on Saturday when the two teams face-off for Game 2 in Boston. And while there will surely be more to take away from that matchup, the Maple Leafs have a good opportunity to take a commanding lead in this series.